I don’t know about you all, but I’m up early. This whole daylight savings hoopla has got me running on a geriatric schedule. I go to bed at 9:30. And by go to bed, I mean pass out in a puddle of my own drool on the couch without warning. It’s something to behold. When my body is tired, it goes down for the count. I realize that this explanation sounds similar to narcolepsy. Funny. Or is it? Should I get this checked out? Meh. Naturally, since I have clocked out early, I am waking up before the sun is out. I get up, inconveniencing our dog. She’s tired. She doesn’t understand this nonsense. Not a morning dog. Typical teenager. Breakfast is important to me. I have written about it before over at The Dabblist. I take it seriously. I like to make sure I am putting something good in my body in the morning to keep my energy up and running into the lunch hour. So, why not make it something seasonal and easy? Plus, it’s another reason to have whipped cream in the morning. Deal. Let’s make a breakfast shake that tastes suspiciously like pie. I can’t get mad at that. While soaking your oats isn’t mandatory, I like to do it. 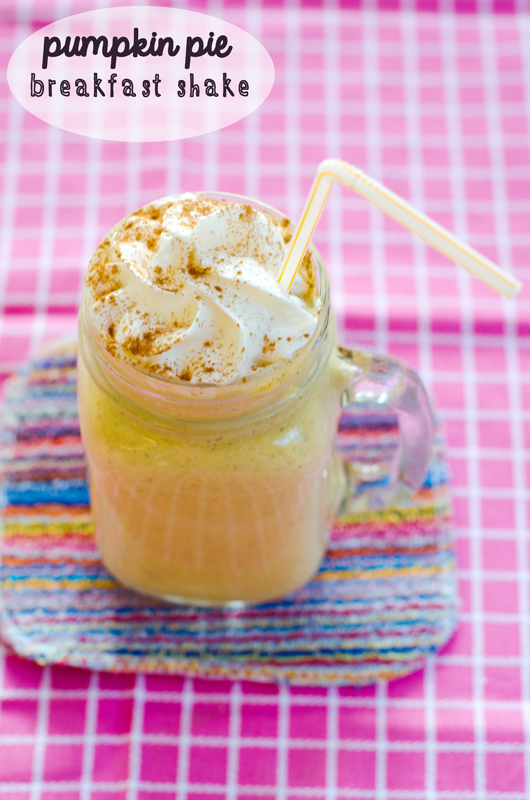 It makes them softer and allows for a creamier texture in your shake. Measure them out, and add water to your measuring cup. After they’ve soaked for at least 15 minutes, strain them and add them to your blender. Add the rest of your ingredients to the blender and power it up. Blend until everything is thoroughly combined and smooth (one to two minutes). Pour into a glass. Top with whipped cream. Power up. Stay fueled into lunch. Have fond memories of your breakfast that tasted like pie. Gina, thank you for linking this in to Food on Friday. We have got a super collection of shakes and smoothies together. I hope you have stopped by some of the other links to check them out!